This product is supplied with a (non waterproof) light detector, and fitted with an SPDT relay rated to switch up to 16 Amps* at voltages of up to 30VDC or up to 250VAC**. All connections are made via screw in terminals on the circuit board. A high quality IP54 rated enclosure is supplied with the necessary fittings to mount the circuit board and with a button fitted into the lid for programming. The enclosure is pre-drilled with holes for the power input, light detector, and relay output connections. The light detector is supplied pre-fitted with 300mm long leads. These can be extended by the user to up to a tested 10 metres (and probably longer) to get the light detector to where it needs to be. * maximum 16 Amps resistive load – e.g. lighting, or under 5 Amps inductive load – e.g. motor, pump, solenoid, relay, or anything else which uses magnetic fields. ** a qualified electrician should be consulted if it is your intention to use this device to switch mains electricity. This is a 12VDC powered device, and so should be powered either by a solar charged or otherwise 12V battery or with one of our mains plug-in 12VDC power supplies. With the light detector mounted in its final position, wait until the ambient light level is at what you consider to be the light/dark dawn/dusk threshold for your particular application. Press and hold the button for more than one second. The red LED will light up (if it is not already lit) and then after the one second of pressing the button, the green LED will also light up. Release the button. You now have 5 seconds to press the button once more to store in memory the current measured light level as the new threshold. Do this and the green LED will then blink 10 times to confirm successful calibration. To set the mode of operation, press the button once. The red LED will light (if it is not already on) and it will then stay on for 2 seconds. When it turns off, press the button Y times where Y is the mode you would like to use – e.g. if you want to use mode 2, press the button twice; if you want to use mode 4, press the button four times. 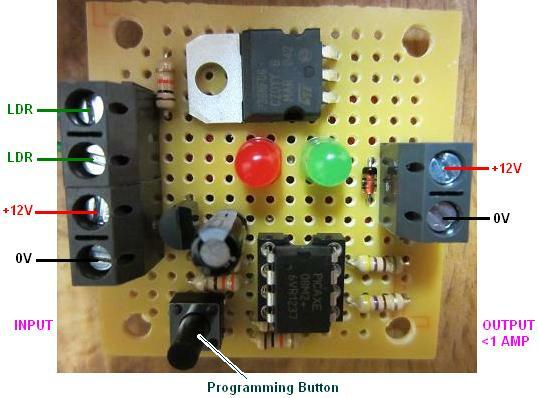 If you have selected Mode 1, Mode 2, or Mode 3, then 5 seconds after your last button press the red LED will blink Y times to give visual confirmation of successful programming. If you have selected Mode 4 or Mode 5, then 5 seconds after your last button press the green LED will turn on for two seconds. When this green LED turns off, press the button X times where X is the number of hours for which you want the relay to remain closed after dusk (Mode 4) or the number of hours after dusk you want the relay to close until dawn (Mode 5). 5 seconds after your last button press the red LED will blink Y times, and then the green LED will blink X times to give visual confirmation of successful programming. Note that the light level threshold and mode selection programmed in by the user will be stored in memory and will not be lost if the unit is disconnected from the power and reset etc. Therefore, you only need to go through the above steps if you actually want/need to change the light level threshold and/or mode selection information stored. 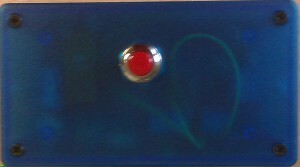 When the measured light level is darker than the user programmed threshold the red LED will light up. If the light level stays below that threshold continuously for 3 seconds* (30 measurements – one every 1/10 of a second) then the relay will close and the orange LED will light up. 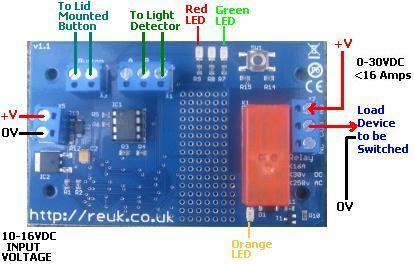 Now, when the measured light level is brighter than the user programmed threshold the red LED will turn off. If the light level stays above that threshold continuously for 3 seconds, the relay will open again and the orange LED will turn off. When the measured light level is brighter than the user programmed threshold the green LED will light up. If the light level stays above that threshold continuously for 3 seconds* (30 continuous measurements – one every 1/10 of a second) then the relay will close and the orange LED will light up. Now, when the measured light level is darker than the user programmed threshold the green LED will turn off. If the light level stays below that threshold continuously for 3 seconds, the relay will open again and the orange LED will turn off. * The 3 second delays are used in Mode 1 and Mode 2 to prevent multi-switching when the measured light level is very close to the threshold, and also to prevent the relay from opening or closing unnecessarily when a shadow or bright light briefly passes over the light detector. 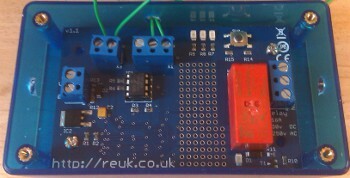 When the measured light level is darker than the user programmed threshold the red LED will light up. If the light level remains darker than that threshold continuously for 25 seconds then it is ‘dusk’. 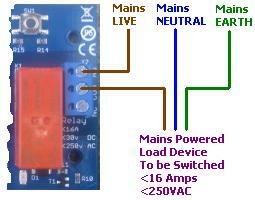 The relay will close and the orange LED will light up. For the next hour, the unit will continue to display the light level status using the red LED – on if darker than threshold, off if brighter than threshold – but these measurements will be ignored to avoid a false dawn for example if a cloud now reveals the sun. After the passing of that hour, the ambient light level will be much darker and so even if clouds were covering the sun earlier, the sun will either have set or be low enough that no false dawn will occur. Through the night the red LED will continue to shine while it remains dark. As dawn arrives, if the measured light level is brighter than the threshold, the red LED will turn off. If the light level then remains brighter than the threshold continuously for 25 seconds, it is ‘dawn’ and the relay will open and the orange LED will turn off. Again for an hour after dawn, the red LED will continue to be used to show if the measured light level is brighter (off) or darker (on) than the threshold, but these measurements will be ignored to avoid a false dusk – if for example, a cloud immediately moves across the sun after ‘dawn’. By the time that hour has passed, the sun will be much higher in the sky and the ambient light level much brighter. This mode works as per the instructions for Mode 3 – the only difference is that after dusk is detected, the relay will close, but only remain closed for X hours after dusk. The relay will then open and remain open through the rest of the night, the following day, and until the next dusk. This mode works as per the instructions for Mode 3 – the only difference is that after dusk is detected, the relay will remain open until X hours after dusk. Then the relay will close and remain closed until dawn. While this unit is very simple to use, it is quite difficult to explain in words here, so if you still have any questions, please feel free to email them to neil@reuk.co.uk. Similarly, please email if you have additional specific requirements which are not met by this multi-mode unit. We are happy to add new modes, or change existing modes to create a tailor-made unit on request.